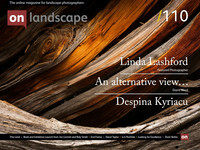 I saw Despina's work at a gallery in London and had wanted to talk with her about her photographs for a while. This year we finally met up at Joe Cornish's gallery in Northallerton for an interview about her history and working practise. Tim: How did you get into photography and art, as you went to art school in Hull? What inspired you to get into art when you were younger? Was it photography to begin with or not? Despina: I used to use those Kodak instantmatic cameras that had the vertical flash bulbs. I took photos of anything in my parents garden so in a way I started from childhood and as I was always good at drawing at school, I veered towards art. Then I did a two year art foundation course - it was a design course for two years at Barnett College. I was trying to find my way in and which direction to go into and because of the way I drew they encouraged me to go into fine art.